Each 2fer is 1.5 oz. (43g) per package and are $2.49 each, or save 10% when you buy 12 packs or more for $2.24! From Kelly of Saugus, Massachusetts on 3/18/2019 . 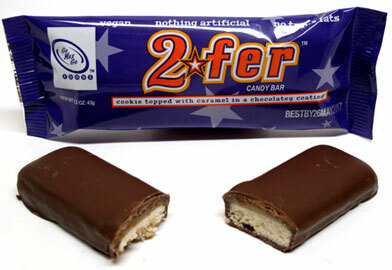 I have been wanting to try 2-fer for a while now, particularly because Twix was one of my top three favourite candies prior to going vegan. However, I noticed a lot of comments about this particular bar was a whole lot of miss and wanted to see for myself if this was actually like Twix or not. Finally eating it, I have to say this is a perfectly acceptable vegan version of Twix. I'm not sure if a lot of the reviews were talking about the previous version, but 2-fer honestly contains what I'm looking for in a Twix-like bar: a cookie with caramel, covered in (vegan) milk chocolate. The cookie has the right flavour, although it does not have the correct texture (if I recall, Twix is significantly more crunchy) and I felt the caramel layer was a bit too thin. I think if it had double the caramel and a slightly crunchier cookie, it would be PERFECT. However, as far as vegan Twix goes, this honestly does the trick for me. I highly recommend this as a vegan version of Twix. Easily in my top 3 favourite Go Max Go Foods candy bars. Now if only someone would make a proper vegan Kit Kat! From Ree King of Detroit, Michigan on 3/13/2018 . They may not taste like twix but they're good try them for yourself. My FAVORITE Go Max Go Candy Bar! From Charlie of Charlotte, North Carolina on 6/11/2017 . These are amazing! Crunchy, chewy, caramelly, and chocolatey. I know I made up some words there, because they are THAT good! Enjoy life! Veganism helps animals, and if you are vegan you should reward yourself with one of these tasty treats! From Beverly of Pasadena, California on 4/29/2017 . This tastes nothing like Twix. The caramel does not taste like caramel and the chocolate tastes like very cheap low quality chocolate. The caramel also does not have the texture of caramel, it is WAY TOO SOFT. Caramel should be nice and chewy, this is so soft it is almost runny! You cannot chew this caramel at all, it pretty much just slides down your throat. The cookie is fairly crisp but it could be crispier; although that hardly matters because the cookie has virtually no flavor whatsoever. The whole bar is way too sweet; everything, the cookie, the caramel and the chocolat. I cannot recommend this bar and I will not purchase it again. From Jon B of Chicago, Illinois on 4/16/2017 . Very tasty! Of course it's not Twix, but this bar stands on it's own. The texture, not as crunchy as Twix (from what I remember of Twix) but still firm, not too dry, not soggy and great combination of flavors make it one of my top two GMG bars.